I tend to ride my Talas RLC (90psi) or my Vanilla 125 (blue, 25lb/in spring) forks wherever I ride. I weigh about 195lbs (yeh, too much beer) and I ride fairly fast and hard. I want my fork to work very well with the proper sag numbers whether I am on a cross country ride or chairlift run by just adjusting my compression damping. I am currently running Red Line Synthetic Oil , 87% Medium (10wt) / 13% Heavy (15wt) (ISO 35). I am still testing this mix, I think it is about right, but it'll take a trip to the chairlifts to know for sure. The damper side of the Fox Forx takes 155 cc's of oil. FYI - The shim stack on my Fox Vanilla RLC consists of two shims. The main shim is 21.5mm x 10mm x 0.005" and the base shim is 16.5mm x 10mm x 0.006". It is a little tight to do much tuning to speed up the high speed circuit with this stack, unless you went to 3 or 4 0.003" shims, but it surely could be slowed down with the addition of another shim. Marzocchi Oil- Marzocchi Bomber Factory Fork Oil comes stock in all bomber forks. It is synthetic and is labeled as being 7.5wt. While this oil can be ordered in the US, Marzocchi is basically repackaging Golden Spectro Cartridge Fork Fluid (125/150, Very Light). This oil is rated at 26.1 cSt@40C/5.25 cSt@100C/VI 150. 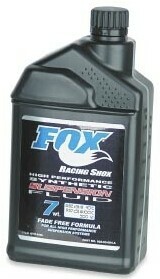 A very similar oil to this is Maxima Racing Fork Fluid (125/150, 7wt). It would be preferred to run a mix of Red Line Synthetic Fork Oil of 37% Red Line (Light, Yellow) & 63% Red Line (Medium, Red). In the past I have found Marzocchi forks to work far better with a thicker oil in them. Answer/Manitou Oil- Manitou forks use, for lubrication, Motorex Semi-Bath Fork Oil, 5W40 from Motorex of Switzerland. This is actually Motorex Motor Oil Power Synt 4T SAE 5W40, a synthetic motor oil. This oil is rated at 90.9 cSt@40C/14.6 cSt@100C/VI 169. This is some serious pancake syrup. This oil is not widely available, but can be ordered at most motorcycle dealers through K&L Supply Co. (PN# 35-3911). Similar oils do not really exist as suspension oils. Closest is Red Line (Heavy) (66.8 cSt@40C/16 cSt@100C/VI 256) or Maxima Bicycle Fork Fluid (20wt) or Maxima Fork Oil (20wt) both of which are rated at 65 cSt@40C/12.9 cSt@100C/VI 201. If you can get access to Red Line Synthetic Motor Oil 5W40, it is rated at 94 cSt@40C/15.1 cSt@100C/VI 170 and is probably your closest bet. For damping, I am told that the manitou used motorex 7.5wt fork oil. Rockshox Oil- Rockshox repackages and sells Torco RFF oils for their forks. This is a blend of synthetic and mineral oils. The goofball aspect to this is that Rockshox in their infinite wisdom re-grades their product. RS2.5=Torco RFF 5, RS5=Torco RFF 7, RS10=Torco RFF 15, and RS15=Torco RFF 20. Rockshox considers their 5 and 10 weights their stock oils in Boxxer forks. RS5 then has a cSt@40 of 16, and RS10 has a cSt@40 of 33. To make RS5 from Red Line Oil use 28% Extra Light and 72% Light, to make RS10 from Red Line Oil use 93% Medium and 7% Heavy. Rockshox RedRum is just Torco MPZ Assembly Lube with the one difference that the Torco product is 117 cSt@40 and the RS Product is 50 cSt@40. This change was for very cold weather performance. Chapter 38 p.5-6 of the Barnett Manual describes a benchtop way of testing an oil based on SAE weight system. A table of some of the worst oils available are listed as well. This is well and good, but a whole big world exists outside of bike shops and far better oil and information is available for those that truely understand the subject. Many OE shock oils are available at bikeparts.com or speedgoat. Having the correct spring in you forks and shock is of paramount importance. A major supplier of aftermarket springs is Mountain Speed. Fox, Rock Shox and Progressive should be able to supply springs of different rates to suit most of you needs. Renton Coil Springs (RCS) also makes titanium springs for bicycle applications. An important note on coil springs. Truly, for almost all recreation or racing applications, the material and quality of manufacture of one spring compared to another is not distinguishable. What is important is that a spring be properly rated. Most aftermarket motorsport spring companies will guarantee that the rate of a spring to be within 2% of actual (but usually run within 1%). This is reasonable from a production point of view. Fox on the other hand allows labled rates to be within 15% of actual (oh my god!). Recently, I decided to go up to a 500# fox spring from a 450# fox spring. While both springs were off the bike I rated them. The 450# rated at 441# (-2%) and the new 500# rated at 450#(-10%). This is pretty lame. Both springs were 4.900" free length and rated between 0.250-1.250" and 0.500-1.500" of compression with consistent results. I even tried ordering a 500# spring from Mountain Speed (Eibach), It was far heavier (in weight) than the stock spring and it only rated at 458#. Finally, I borrowed another riders seemingly identical stock 450# labled spring and it rated at 480#. It is pretty amazing that this kind of crap can go on in a supposed race quality part. If you have access to a spring scale, always rate your springs. Never believe a label or company claim. Hypercoils is a premier example of how springs can be done right. It is a shame that they do not participate in the bicycle market. My spring scale is an Electronic Coil Spring Tester - by Longacre Racing. For air forks, everybody has a little shock pump hanging around. They are all about the same quality with a gauge that spans from 0-300 psi. There lies the problem. Most people are using their pumps only in the 100 psi or 150 psi range. It is very hard to get the kind of accuracy necessary on today's highly sensitive air forks. It makes sense to replace the flimsy 300 psi gauge with one that is in the range that you are tuning in. If you have two pumps get one gauge that goes to 100 psi and another that goes to 200 psi. Always carry the greater capacity pump with you on rides - just in case. You can get 1 1/2" dial gauges (1/8 NPT) from McMaster Carr (#3846K1 Catalog p.505) for $9.92 each.